Welcome friends to issue #10. Well, the groundhog didn&apos;t see his shadow in February so I&apos;m taking him at his word that we will have an early spring. Daylight Savings Time is arriving early this year too. Perhaps March will come in like a gentle lion for once, yeah, right! 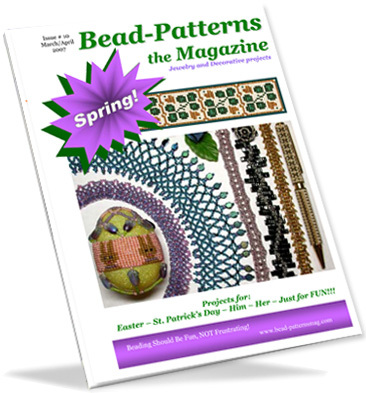 Anyway, no matter the weather we have lots of projects for springtime holidays in this issue. Everyone is Irish on St Patrick&apos;s Day; join in the wearing of the green with this clever loomed or square stitched shamrock bracelet! 7" long x 1" wide when stitched with size 11 Delica beads. Fire polished faceted rounds make a flashy contrast to the muted matte mauve seed beads in this gorgeous wavy-edged bracelet. A unique combination of herringbone & ladder stitch! 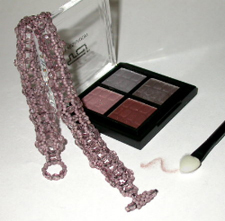 This 7.5" bracelet flaunts a stitch-as-you-go picot edge. When working double herringbone you add 4 beads with each stitch so these 5 adorable bunnies stitch up twice as fast. 1 egg, plastic or wooden 1 3/4" diameter &	5 3/4" circumference. A free-form zigzag of modified brick-stitched black cubes creates the 7" bracelet base. 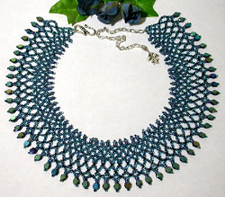 A lightening bolt of silver-lined seed beads races across the top for added zing. 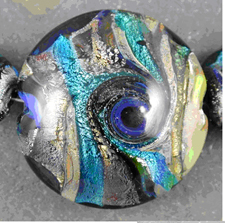 Select an interesting button for the closure that will complement your bead choices, Linda found a black and silver pressed glass button that is just perfect for her beads. A few simple tips on finding high quality artisan made beads on one of the favorite internet auction sites. 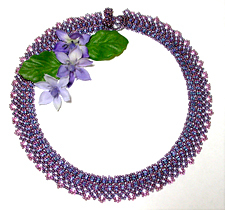 Pink and lavender seed beads combine with blue triangles to create a subtle blend of color. Just 3/4" wide this necklace will add a delicate flash of color to a spring outfit. These easy to stitch peyote panels transform pen blanks into memorable gifts for any occasion. Plaid and stripes for him and flower buds for her. These custom made bracelets are a popular gift for Mothers & Grandmothers to celebrate Birthdays, Mother&apos;s day, or to welcome a new baby. Here&apos;s a plan for designing your own version using sterling silver alphabet blocks, Swarovski crystals for birthstone details, and sterling silver accent beads and a Bali toggle clasp. Get your alphabet blocks early before the popular letters are sold out! It&apos;s in stock and ready for delivery. I&apos;ve had an advance prototype of this extremely versatile loom for a few months and just love the many unique features. FREE Instructional Videos can be found at YouTube.com. 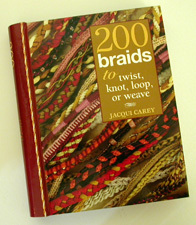 Beautifully photographed in full color with easy to follow step by step instructions this spiral bound 256 page book offers an amazing array of cords that you can make. Design a custom colored cord to showcase a special beaded bag, peyote amulet, or a gorgeous art bead.